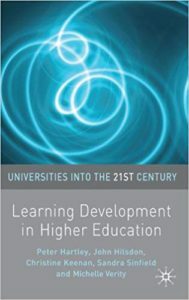 Collating contributions by partners in the LearnHigher CETL, Learning Development in Higher Education (2010) shows how learning development enhances the student experience and promotes active engagement. It includes important insights for everyone interested in supporting student retention, progression and success. The book is edited by Peter Hartley, John Hilsdon, Christine Keenan, Sandra Sinfield and Michelle Verity and is (Preview this book). Raising the Student Voice; S. Sinfield et al.